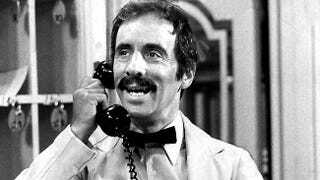 Fawlty Towers actor Andrew Sachs has died, aged 86, after a four year battle with dementia. While he will be forever known as Manuel, the put-upon Spanish waiter in the John Cleese comedy, Sachs was almost the Seventh Doctor and has an array of genre credits. Born in Germany, his family moved to Britain to escape the Nazi regime. They settled in Kilburn, North London. In 1950, he juggled studying shipping management with worth on experimental progammes for the BBC Radiophonic Workshop. he went on to appear in shows such as The Saint and Randal and Hopkirk (Deceased). He was renowned as a narrator and reader of audio books, including works by CS Lewis. In 1978, he wrote and performed in The Revenge, a play for Radio 4 that does not have any dialogue. He played Watson to Clive Merrison’s Sherlock Holmes, took the lead in The History of Mr Polly and appeared as Toliver Groat in Terry Pratchett’s Going Postal. In a Douglas Adams hat-trick, he was the voice of The Hitch-Hiker’s Guide to The Galaxy on stage, played Reg in the radio Dirk Gently and performed in the McGann recreation of Shada. He also had numerous roles in the Big Finish Doctor Who. Sachs became the unwitting participant of a crude prank call from Russell Band and Johnathon Ross where they left explicit messages detailing brand’s sexual relations with his granddaughter, Georgina Baillie, who was part of burlesque group Satan’s Sluts. The message were broadcast on Radio 2, sparking a row that still reverberates.